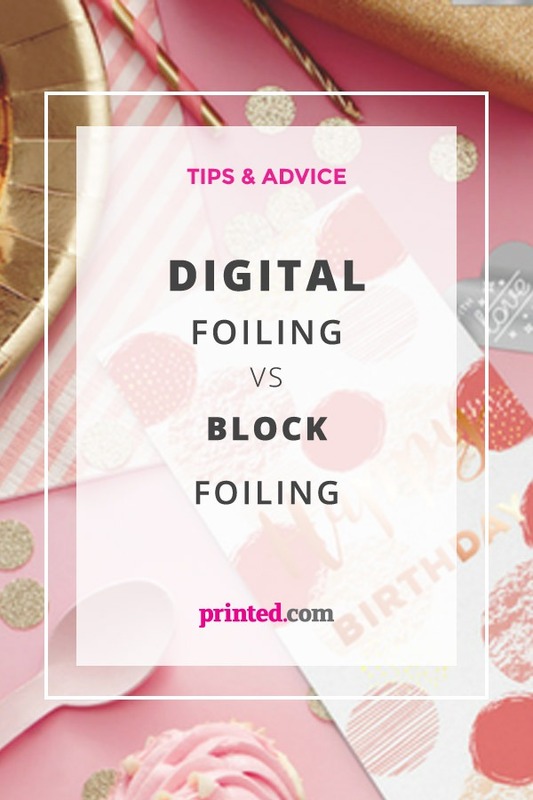 Digital Foiling vs. Block Foiling: What’s the difference? When you print with foil at Printed.com, we use a process known as Digital Foiling. But what exactly is it, and how is it different from traditional Foil Blocking? In short, both methods will leave you with shiny, metallic accents, printed onto your design. What’s different is the way that they’re printed, and the finished effect you’ll get from both. Traditional Foil Blocking (or hot foil stamping) involves applying metallic foil to paper or card, using heated plates (or die). This leaves your foiled elements slightly debossed and textured – as the foil is hot pressed onto your card or paper stock. This process works best on uncoated, thicker paper stocks. What designs can you print with traditional Foiling? With traditional hot press foiling, you can foil almost any design.Smaller, intricate designs that feature fine details and serif style fonts aren’t ideal for Digital Foiling, so we’d suggest traditional methods if you’re after something precise. However, if you’ve got bolder text, or large areas that need the foil treatment, Digital Foiling is ideal. If you’re not sure what kind of Foiling is best suited to your project, our friendly team are happy to help. You can get in contact with them here. So what about Digital Foiling? Unlike traditional Foil Blocking, Digital Foiling doesn’t require the use of plates – it’s printed directly from a file on the computer. This means that there are no set up costs, making it ideal for short runs and smaller orders. What designs can you print with Digital Foiling? Digitally Printed Foil results in a flat print product, without any texture or de-bossing. Once printed, we finish all of our Foiled Print with Velvet Lamination (you can choose either one sided or double sided, but whichever side you choose to add foiling to must be Velvet Laminated). This protects your print with a durable, hardwearing finish. Digital foiling is available at Printed.com in seven colours, silver, gold, rose gold, copper, red, blue and green – on Silk, Uncoated and Trucard paper stocks. If you want to use a luxury paper stock, you’ll need to use traditional Block Foiling. You can’t choose this on site just yet, so fill in our quick and easy Bespoke form. We’ll get back to you within 24 hours with a quote. Setting up your artwork for Foiling is as easy as creating just two separate print files! Our handy video tutorial will walk you through the entire process, or take a look at our quick reference PDF guide on getting your print ready for the presses. Got a question about Foiling? Our Customer Service Team are here hand to help. Call them directly on 0800 840 1430. They’re here every weekday from 8.30am ‘til 6.30pm. Or, drop them a line to theteam@printed.com or chat live on site. Which Foiling method will you be using for your next print job? Let us know in the comments, or share your foiled creations with us on social. Tweet @printed_com, check us out on Instagram printedcom, and visit our Facebook page to give us a like. Don’t forget to tag us using the hashtag #ProudlyPrinted while you’re at it too! Very informative and lovely read! I used digital gold foil on my order of wedding invitations. It came out really nicely and would recommend!